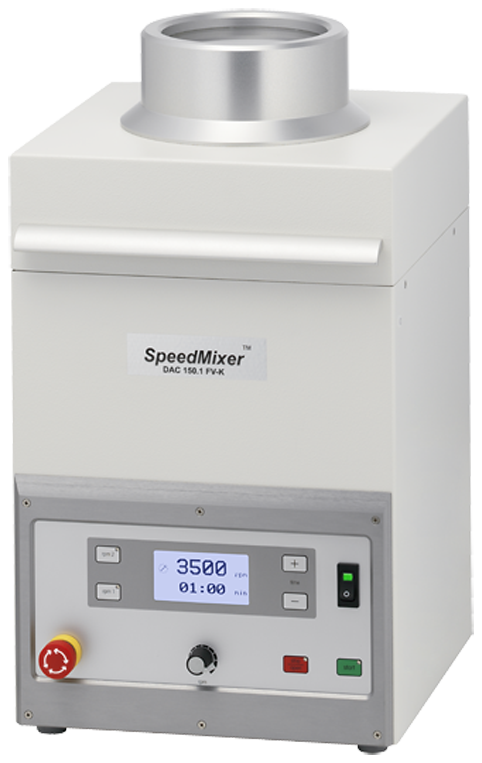 The SpeedMixer™ DAC 150.1 FV-K is an economical laboratory-sized instrument for the rapid mixing and grinding of materials that would otherwise require large amounts of time and/or effort to mix and/or grind with the added advantage of a Cartridge Lid enabling the user to mix directly into syringes or cartridges. 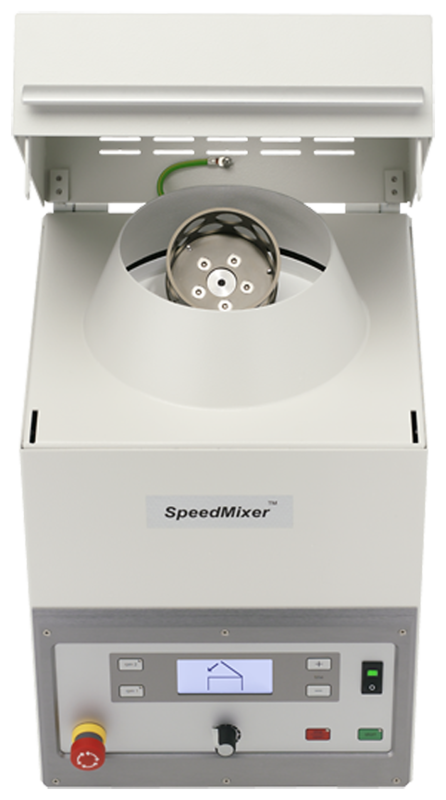 The SpeedMixer DAC 150.1 FV-K works by spinning a high speed-mixing arm in one direction while the basket rotates in the opposite direction (thus, the name - Dual Asymmetric Centrifuge). This combination of forces in different planes enables incredibly fast mixing, and yet the precision construction of each machine gives it a balance that allows amazingly quiet operation. With this instrument, the typical mixing time for fully dispersing a color paste in a silicone sealant is less than 10 seconds; for mixing fumed silica or precipitated chalk silicone formulations 8 - 14 seconds will normally suffice. These are both operations that would otherwise require 3 hours or more of mixing time, and they can only be done in quantities of 1 quart or greater. Mixing never incorporates air and additional mixing time removes air from the blend, yielding a finished product when the mixing process is done. Fluids of widely differing viscosities can be blended quickly. The advantages of the Cartridge Lid include the ability to mix directly into syringes & cartridges for sampling etc. that in turn can be sent direct to the customer for dispensing direct from the containers. The main current applications are for lab screening of development formulations and formulation components, for QA testing, and for small volume production. The incredible speed of mixing / grinding allows a complete sealant, coating, plastisol, or adhesive batch to be made in less than 5 minutes! The bottleneck now becomes the weighing operation, not the mixing / grinding. This makes every SpeedMixer™ user a better compounder, since it allows the mixing of many iterations that would otherwise go untested due to time constraints. The SpeedMixer DAC 150.1 FV-K has proven itself extremely useful for tests involving cure rates, colors, and appearance, as well as the measurement of basic physical properties. This permits the screening of numerous formulations before the next phase of development scale-up. 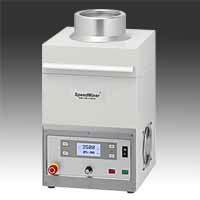 SpeedMixer technology involves using the proper cup for each mixture to be run. Contact us for recommendations on the products to be used. 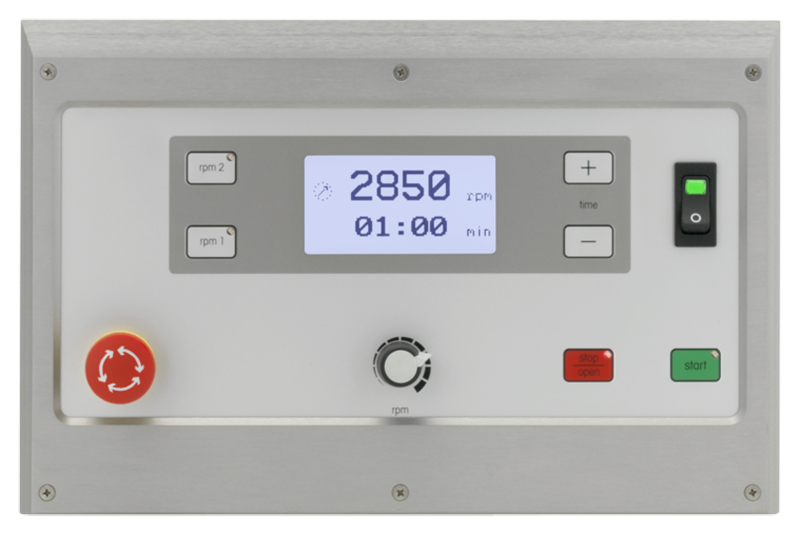 Especially designed for research and development work, the DAC 150.1 FV-K has variable speed (300 - 3500 rpm, set by the revolution rate) and a window for viewing the mixing basket, allowing more in-depth research work to be done. The speed is adjusted by simply turning the control dial. Additionally, fixed speeds can be set using the keyboard and by-pass the speed control dial - in order to carry out a series of batches at a desired speed. Using lower speeds can help avoid some of the effects of the tremendous centrifugal forces generated at top speed, e.g., the build-up of frictional heat in sensitive mixes, or the potential damage to microenvironments.